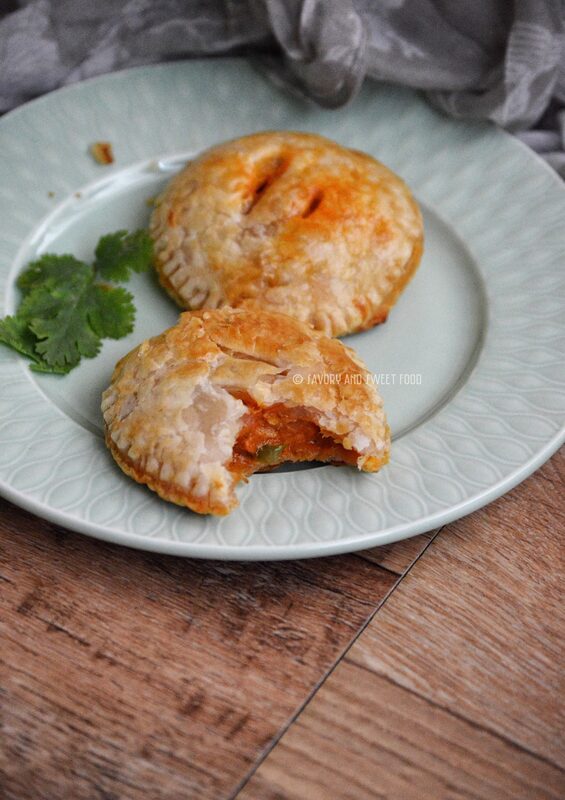 Mini Chicken Puff Pies with a spicy chicken filling. These are perfect mini treats which are great for groups if you wish to share. 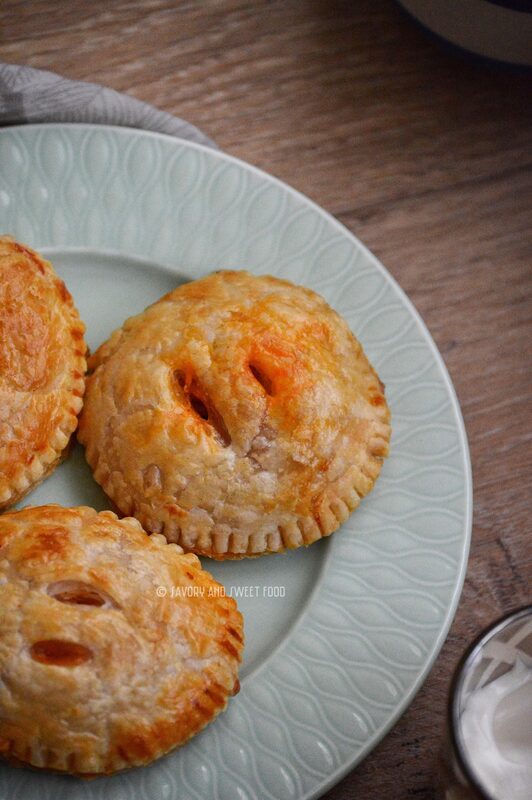 Don’t these pies looks so adorable? 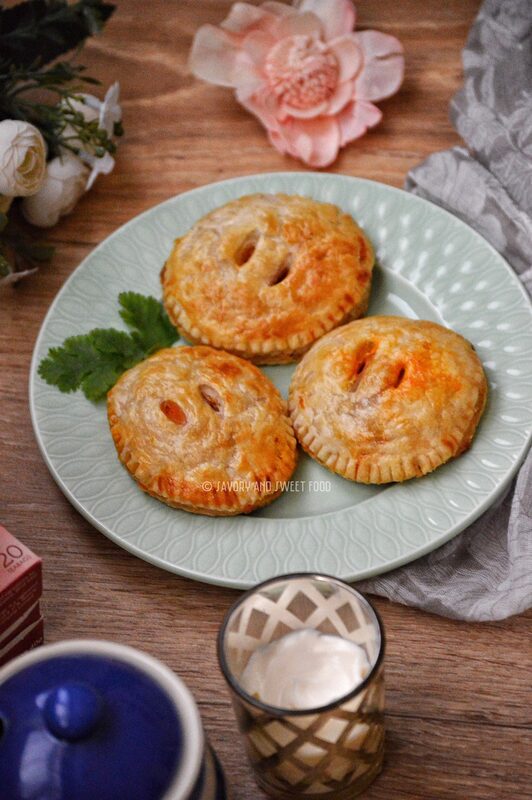 I noticed that you all love appetizers and so I am very excited to post the recipe of this delicious, super easy Mini Chicken Puff Pies. I love anything with puff pastry, just any thing seriously. Be it Savory or Sweet Food. 😉 But yeah, making puff pastry from scratch can be tricky and time consuming. I remember there were few requests for home made puff pastry sheets from you guys, but I am so extremely lazy nowadays that I never tried making it from scratch. 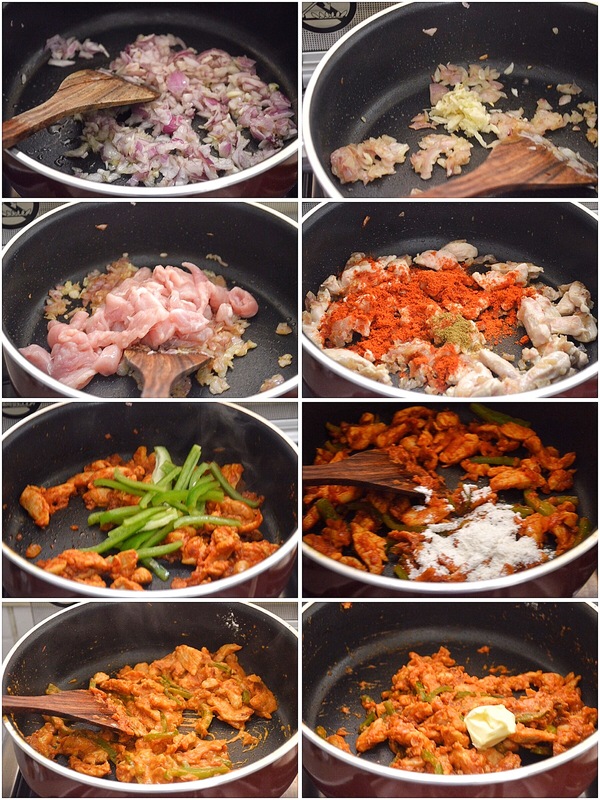 I will do it very soon and post the recipe, in shaa Allah. It is very satisfying to bake from scratch, but one of my favorite guilty pleasures is frozen puff pastry. It’s fast, flaky and beautifully buttery. And when you make mini pies with it, you can just grab and gobble it up easily. I stuffed the pie with a very simple, slightly creamy chicken filling. I didn’t add mozzarella cheese, but I’m pretty sure that it would taste awesome if you add it. You can make larger pies or triangle shaped pies, but I like this small round shaped ones because they look very pretty and dainty. You can make this ahead and freeze it, and bake them on the day you need them and serve it hot and fresh straight from the oven. So here is the recipe, please do give it a try. In a pan, pour in oil. Once it heats up, add in the chopped onions. Sauté till soft. Put garlic and mix for a minute. Add chicken and stir around till the outside of chicken turns white in color. Add red chilli powder and cumin powder. Mix well. Add flour and mix evenly. Pour milk and stir well and cook till a sauce forms. Let it come to a boil. Turn off heat and drop in butter. Preheat the oven 375°F/200°C. Line baking sheet with parchment paper. If you are using puff pastry rolls, then dust work surface with some flour and roll out the pastry as evenly as possible to about 2/8th of an inch thickness. I used the precut ready puff pastry sheets. If using the large roll, then cut out as many circles you can with a 3 inch cookie cutter. Brush the edges of the pastry with some egg wash and place a spoon of the cooled chicken filling in the center. Place the second circle on top of this and seal the edges with your fingers first and then crimp the edges with a fork. 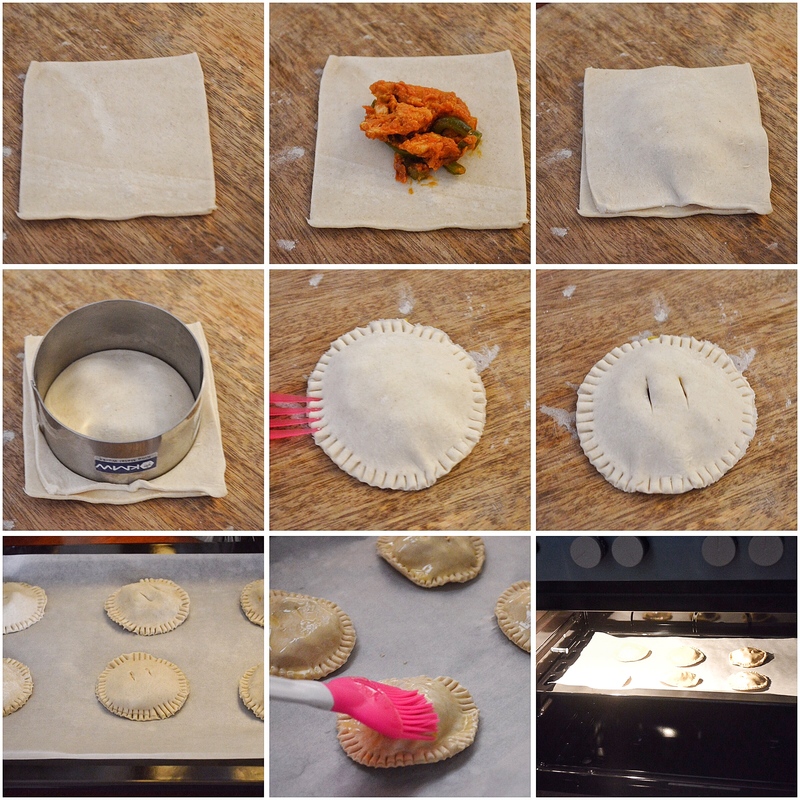 If you are using the small sheets, then place the chicken filling on top of one square sheet, and then place the other sheet on top the filling. Cut out a circle with a cookie cutter and then seal edges with fork as shown in the picture. Place the pies on top of the baking tray, leaving an inch space between the pies. Brush the top with egg wash, make two slits on top of the pastry for air to escape. Bake in the preheated oven till the top gets golden brown in color and puffed up. 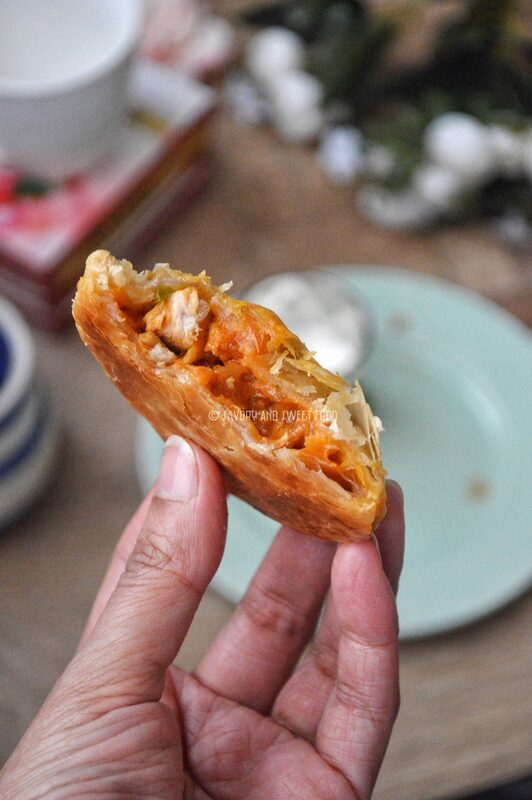 Mini Chicken Puff Pies with a spicy chicken filling. These are perfect mini treats which are great for groups if you wish to share. 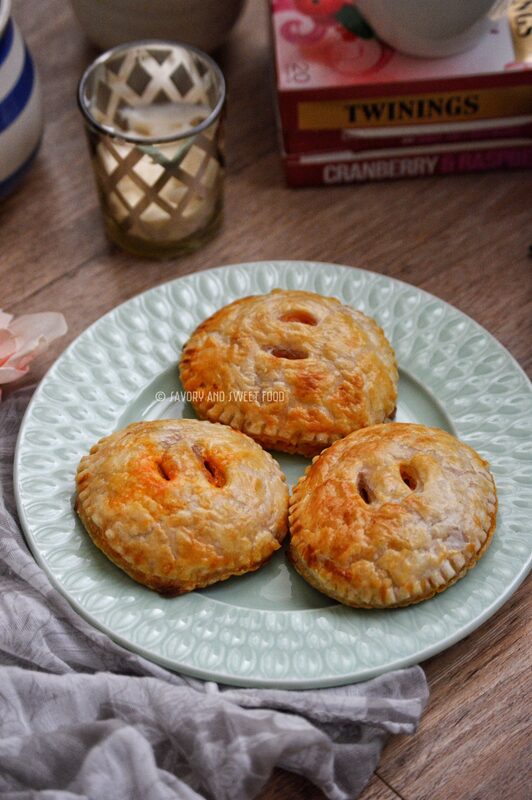 Don't these pies looks so adorable? Looks amazing / do you have a particular brand of puff pastry that you recommend? Thank you Sadaf. There is a brand named just roll. That is the best. Looks so yummy. I’m making it this weekend. Your recipe calls for Mozzarella cheese. But I didn’t find anywhere in the directions where you use it. Could you please let me know whether I missed it in the instructions as I already went thru it 3 times. Oh sorry for the confusion Nisha. Actually I didn’t add mozzarella, it’s optional. But I didn’t mention it in the recipe instead wrote in the write up. I will edit it. If you want to add mozzarella, you can place the cheese on top the chicken filling and then cover with the other puff pastry.